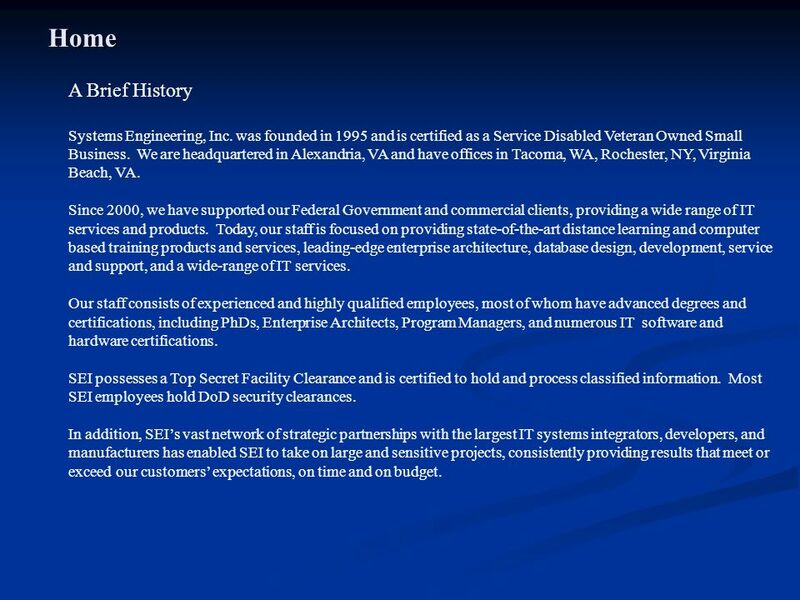 Home Quality Assurance Team members Experience Contacts Task Orders Technical Instructions S e Welcome to SEI’s SeaPort-e Team Website Systems Engineering, Inc.
2 Home A Brief History Systems Engineering, Inc. was founded in 1995 and is certified as a Service Disabled Veteran Owned Small Business. We are headquartered in Alexandria, VA and have offices in Tacoma, WA, Rochester, NY, Virginia Beach, VA. Since 2000, we have supported our Federal Government and commercial clients, providing a wide range of IT services and products. Today, our staff is focused on providing state-of-the-art distance learning and computer based training products and services, leading-edge enterprise architecture, database design, development, service and support, and a wide-range of IT services. Our staff consists of experienced and highly qualified employees, most of whom have advanced degrees and certifications, including PhDs, Enterprise Architects, Program Managers, and numerous IT software and hardware certifications. SEI possesses a Top Secret Facility Clearance and is certified to hold and process classified information. Most SEI employees hold DoD security clearances. 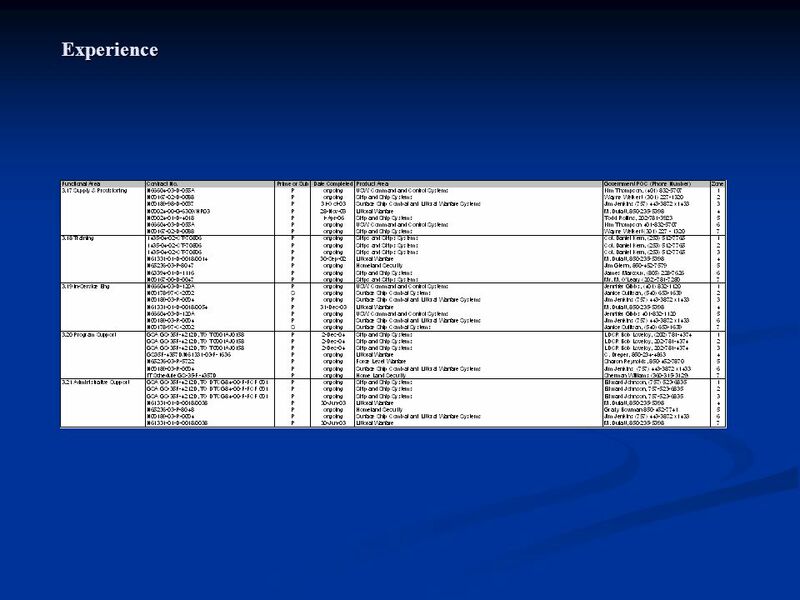 In addition, SEI’s vast network of strategic partnerships with the largest IT systems integrators, developers, and manufacturers has enabled SEI to take on large and sensitive projects, consistently providing results that meet or exceed our customers’ expectations, on time and on budget. The SEI QA approach is based on written procedures and focuses on achieving continuous improvement of every process used to create products and services. Our streamlined management style, underscored by employee and subcontractor involvement, harnesses the creativity and commitment of our team. Process improvements are recognized and those responsible rewarded. Quality is not something that can be incorporated into an activity after defects occur. It must be designed into the process during the analysis and design phase and carried through to the development and implementation phases. Evaluation of product quality is not a one-time step but must take place continuously. Although the PM is responsible for overall task order quality, each member of the SEI Team is responsible for achieving high quality workmanship. 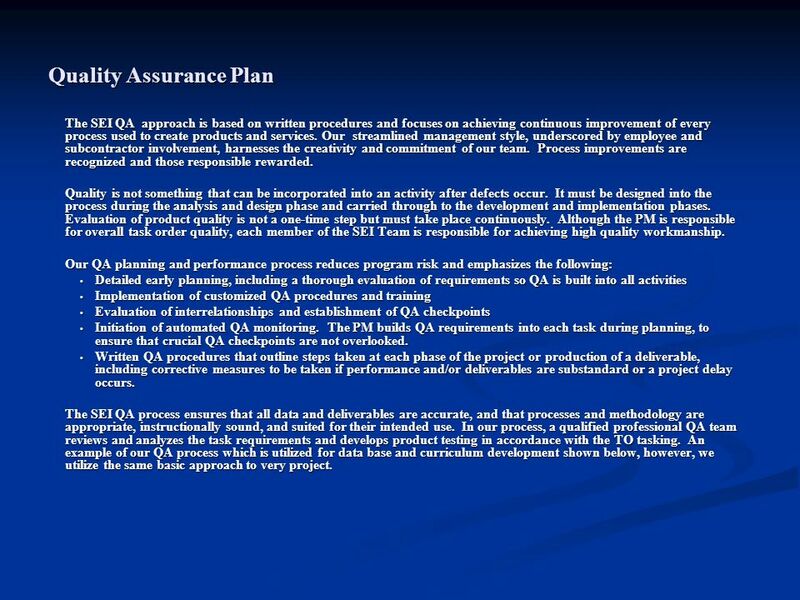 Our QA planning and performance process reduces program risk and emphasizes the following: Detailed early planning, including a thorough evaluation of requirements so QA is built into all activities Implementation of customized QA procedures and training Evaluation of interrelationships and establishment of QA checkpoints Initiation of automated QA monitoring. The PM builds QA requirements into each task during planning, to ensure that crucial QA checkpoints are not overlooked. Written QA procedures that outline steps taken at each phase of the project or production of a deliverable, including corrective measures to be taken if performance and/or deliverables are substandard or a project delay occurs. The SEI QA process ensures that all data and deliverables are accurate, and that processes and methodology are appropriate, instructionally sound, and suited for their intended use. In our process, a qualified professional QA team reviews and analyzes the task requirements and develops product testing in accordance with the TO tasking. 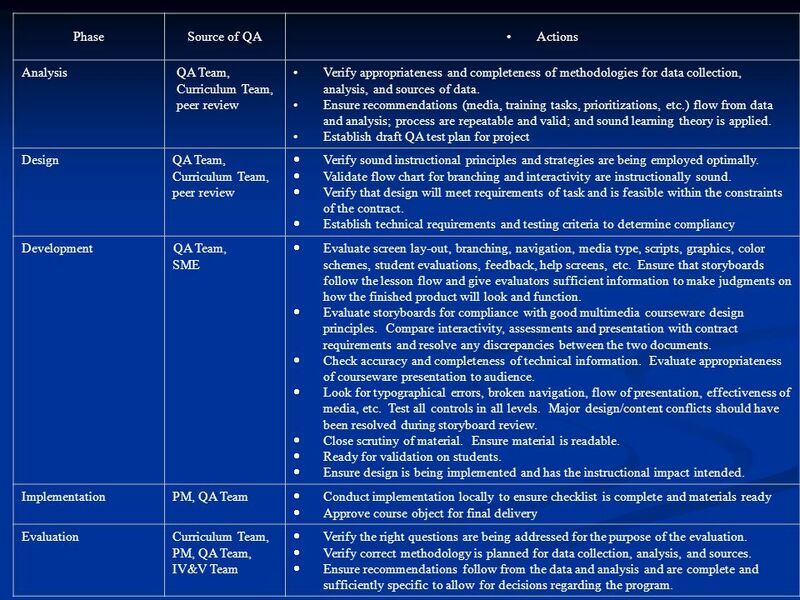 An example of our QA process which is utilized for data base and curriculum development shown below, however, we utilize the same basic approach to very project. 4 Phase Source of QA Actions Analysis QA Team, Curriculum Team, peer review Verify appropriateness and completeness of methodologies for data collection, analysis, and sources of data. Ensure recommendations (media, training tasks, prioritizations, etc.) flow from data and analysis; process are repeatable and valid; and sound learning theory is applied. Establish draft QA test plan for project Design Verify sound instructional principles and strategies are being employed optimally. Validate flow chart for branching and interactivity are instructionally sound. Verify that design will meet requirements of task and is feasible within the constraints of the contract. Establish technical requirements and testing criteria to determine compliancy Development QA Team, SME Evaluate screen lay-out, branching, navigation, media type, scripts, graphics, color schemes, student evaluations, feedback, help screens, etc. Ensure that storyboards follow the lesson flow and give evaluators sufficient information to make judgments on how the finished product will look and function. Evaluate storyboards for compliance with good multimedia courseware design principles. Compare interactivity, assessments and presentation with contract requirements and resolve any discrepancies between the two documents. Check accuracy and completeness of technical information. Evaluate appropriateness of courseware presentation to audience. Look for typographical errors, broken navigation, flow of presentation, effectiveness of media, etc. Test all controls in all levels. Major design/content conflicts should have been resolved during storyboard review. Close scrutiny of material. Ensure material is readable. Ready for validation on students. Ensure design is being implemented and has the instructional impact intended. Implementation PM, QA Team Conduct implementation locally to ensure checklist is complete and materials ready Approve course object for final delivery Evaluation Curriculum Team, PM, QA Team, IV&V Team Verify the right questions are being addressed for the purpose of the evaluation. Verify correct methodology is planned for data collection, analysis, and sources. Ensure recommendations follow from the data and analysis and are complete and sufficiently specific to allow for decisions regarding the program. 5 SEI assumes full responsibility for the quality of our products and guarantees that any corrective measures will be taken at no additional cost to ensure that the Government is completely satisfied. This process ensures that exceptional quality is achieved in all our products including: Instructor-Led Materials Technology-Based Training Products Learning Organization Strategies Learning Systems Development and Integration Knowledge Management Systems Training Management Systems Analysis Evaluation Print Based Instructional Materials Within SEI all team members are subject to the same schedules and quality assurance requirements. Each of the SEI Team members accepts and fully supports the SEI QA approach. Adherence to Delivery Schedules After a TO is delivered, our PM executes the detailed MP developed for the proposal. The PM develops a labor allocation for assigned personnel across the TO’s funded time line. This labor allocation gives a clear picture of what the funding can accommodate and alerts the SEI PM to any adjustments that may be needed as the project progresses. The SEI PM compares labor expenditures against tasks completed and from these develops projections of resources needed to adhere to approved delivery schedules. 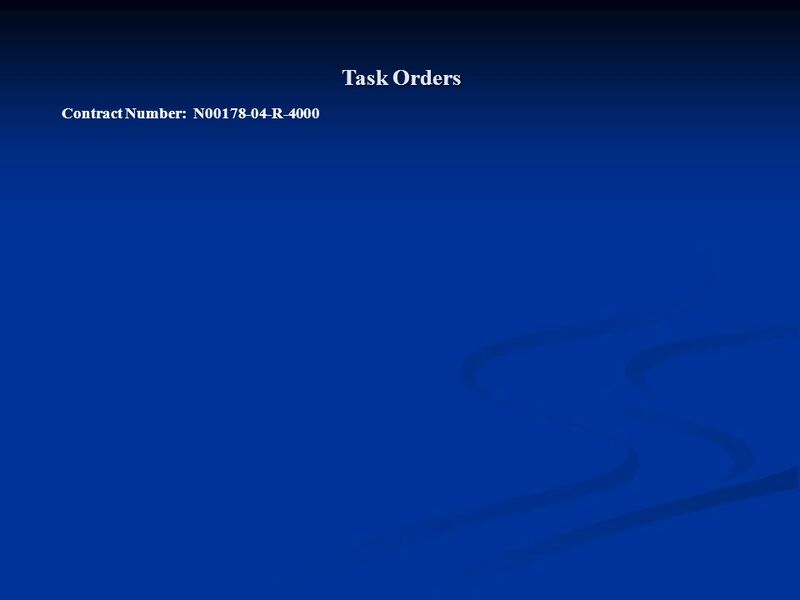 The percent of task completion can be measured in many ways including lines of code, number of graphics, or number of storyboards. The important element is that the measure must be quantifiable and it must be measured at the same time that labor hour expenditures are measured. Reports are produced to keep an accurate total and complete documentation of all contract charges versus progress achieved. These reports automatically calculate percent of time and funds expended against task completion, enabling the SEI PM to instantly see if expenditures are on track. This information is provided on monthly progress reports to the Government along with progress made, travel completed, and the status of deliverables. SEI will use our proven project management system to ensure that adequate resources are allocated to each task order, schedules are maintained, and that CSCS management personnel are informed of current progress, issues, and task status. In addition to a formal monthly progress report prepared for the Government, other forms of both scheduled and unscheduled communication will continue through the life of each task/project. The SEI PM will conduct formal and informal reviews with the project leads to examine the progress of work, identify potential problem areas, and specify potential new task areas that may require early identification of special skills. Action items resulting from the reviews will be numbered, assigned, and tracked by the TLs until they are resolved. The PM will keep the Contracting Officer’s Representative (COR) and Contracting Officer (CO) informed of schedule status and potential problems through frequent contact and formal progress/status reporting procedures. This ensures continued high-level visibility for the program and full compliance with reporting requirements of the contract. 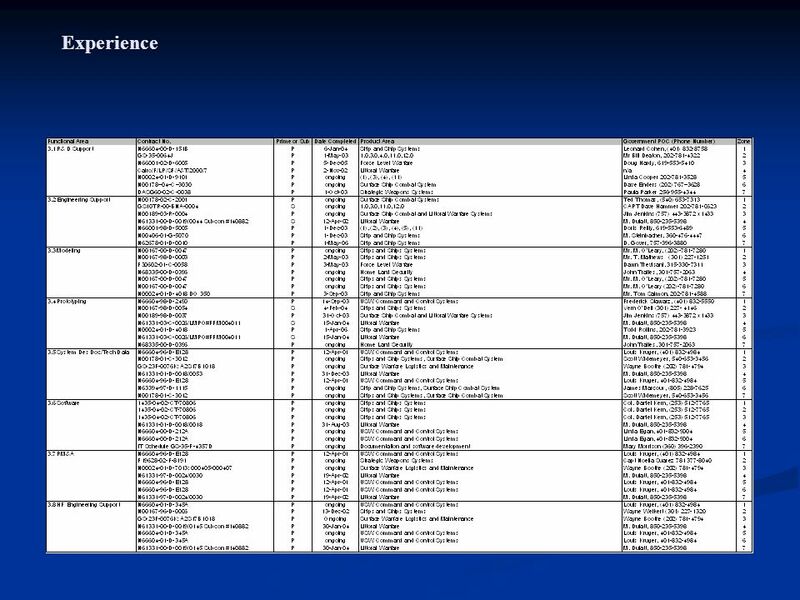 SEI will use the performance review mechanism, described below, throughout task/project performance. Anteon is a leading provider of information technology solutions and advanced engineering services to government clients. 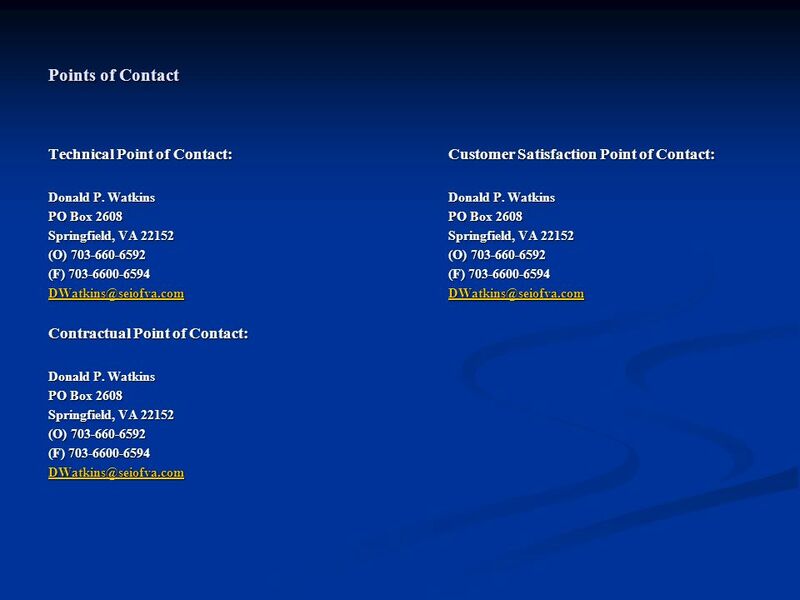 Headquartered in Fairfax, Virginia, they have a 27 plus-year corporate history marked by continual growth in revenue and customer base, with approximately 7,600 employees at over 100 offices serving more than 1000 customer organizations worldwide. They are led by a senior management team whose members average over 20 years of management experience and nearly eight years tenure with Anteon. Open System Sciences works with Anteon on a regular basis as a subcontractor, including the Enabling Technologies contract. Rockwell Automation Rockwell Automation is a leading global provider of industrial automation power, control and information solutions. A strong partnering program and a strategy to build knowledge across customers’ applications provides unmatched resources and expertise to deliver machinery control aboard US Navy vessels, chemical weapons demilitarization, and global support. Headquartered in Milwaukee, the Control Systems division is organized into three operating units: Components and Packaged Applications, Automation Control and Information Group and Global Manufacturing Solutions. These businesses provide a comprehensive suite of Automation Solutions along a value-added continuum that ranges from power and components to control and information platforms to global manufacturing solutions. Products available from RA include Integrated Networks, Programmable Controllers, Human-Machine Interface, Software MMI/HMI, Sensing Products, Industrial Controls, Power Transmission, Scalable Intelligent I/O Platforms, Motors, Intelligent Motor Control, Drives, Motor Control Centers, and Asset Management. RA is represented in more than eighty countries with over 450 sales and support offices and 3,500 distributors/agents worldwide. Globally, one in every five employees is in the field, specifically charged with serving customer needs. RA has a history of successes with the U.S. Navy, from the Mine Countermeasure (MCM) ship class to weapons elevators on Aircraft Carriers. 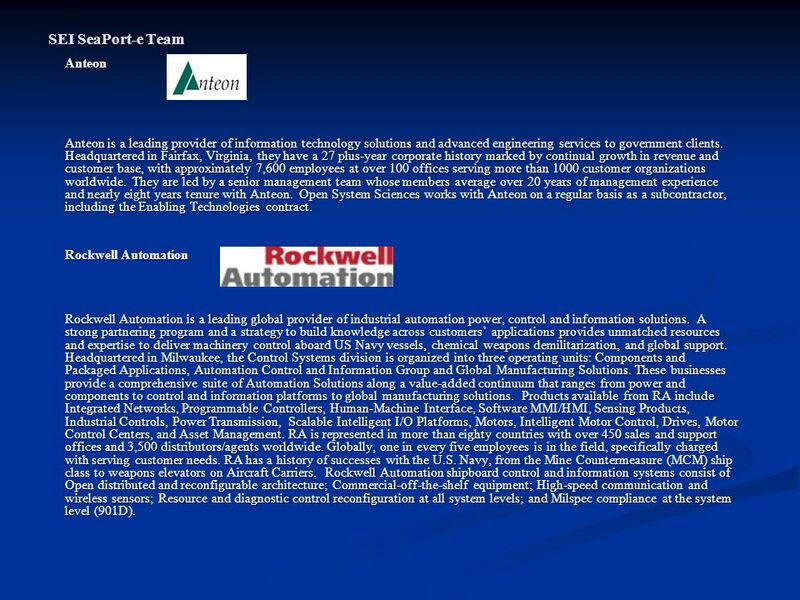 Rockwell Automation shipboard control and information systems consist of Open distributed and reconfigurable architecture; Commercial-off-the-shelf equipment; High-speed communication and wireless sensors; Resource and diagnostic control reconfiguration at all system levels; and Milspec compliance at the system level (901D). Founded in 1991, Open System Sciences (OSS) provides comprehensive high-technology services and products to design, build, manage and enhance distributed enterprise IT environments. Whether it's a large-scale strategic information system or a small system conversion, OSS' strong technical expertise and extensive industry alliances provide a single source alternative to today's multi-vendor world of Information Technology. We have more than ten years experience providing qualified and cleared technical staff to design and support secure networks serving more than 2,000 users, with over 15,000 users worldwide currently supported. 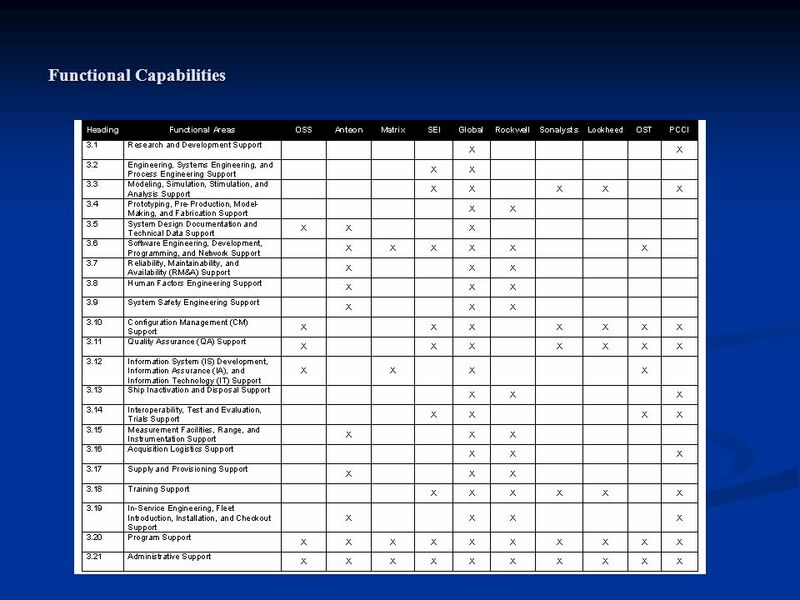 This experience includes support for the Naval Sea Systems Command (NAVSEA), Office of the Secretary of Defense (OSD-C4I), the Defense Information Systems Agency (DISA), the Military Sealift Command (MSC), Pentagon Telecommunications Center (PTC), and the United States Coast Guard Finance Center (USCG FINCEN). Our assembled Seaport Enhanced includes both large and small businesses, some that we have teamed with on numerous occasions, including Anteon, Systems Engineering Inc. (SEI), Optimal Solutions & Technologies (OST), and Matrix Engineers, therefore have a strong working relationship with half our Team members. 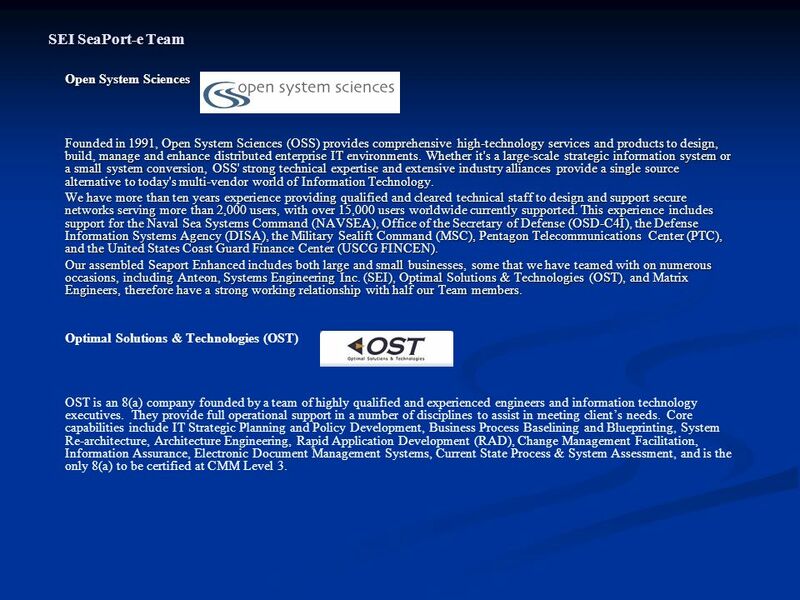 Optimal Solutions & Technologies (OST) OST is an 8(a) company founded by a team of highly qualified and experienced engineers and information technology executives. They provide full operational support in a number of disciplines to assist in meeting client’s needs. Core capabilities include IT Strategic Planning and Policy Development, Business Process Baselining and Blueprinting, System Re-architecture, Architecture Engineering, Rapid Application Development (RAD), Change Management Facilitation, Information Assurance, Electronic Document Management Systems, Current State Process & System Assessment, and is the only 8(a) to be certified at CMM Level 3. Matrix Engineers is an SBA 8(a) Certified Native-American, Woman-Owned, Small Disadvantaged Business that was established in 1988, and is based in San Marcos, California. Matrix has grown from a family-owned and operated engineering firm to a well established corporation of talented Engineers and IT professionals spanning from California to Washington D.C. They are a provider of enterprise engineering and technology products and services. With mature industry expertise and proven experience in engineering and technology solutions, Matrix Engineers can mobilize the right people, skills, alliances, and technologies to meet NAVSEA’s needs. PCCI, Inc. PCCI, Inc. is a veteran’s owned small business that has specialized experience in environmental engineering of marine systems, ship salvage engineering, and diving and life support systems. 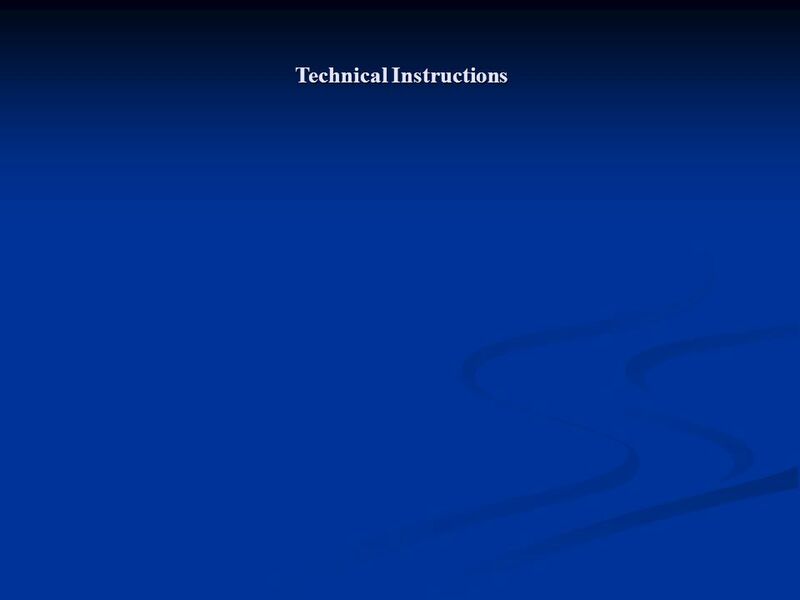 For over twenty years, PCCI has provided sensible solutions to difficult engineering and environmental problems in coastal, ocean and inland environments. Their hands-on experience in environmental planning and protection, marine equipment engineering and fabrication, and ocean project management, has allowed PCCI to deliver sensible answers to their client’s most demanding engineering and environmental questions. 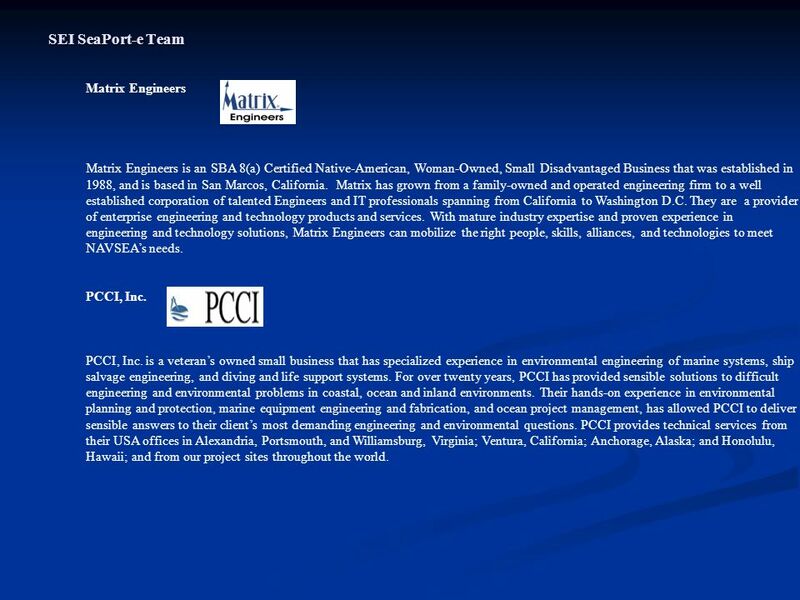 PCCI provides technical services from their USA offices in Alexandria, Portsmouth, and Williamsburg, Virginia; Ventura, California; Anchorage, Alaska; and Honolulu, Hawaii; and from our project sites throughout the world. 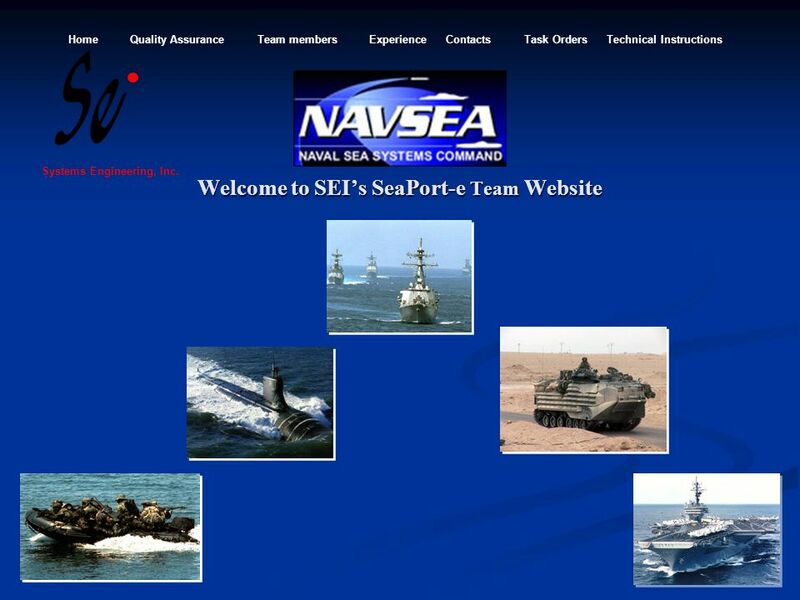 9 SEI SeaPort-e Team LSA LSA is an American Indian woman-owned small business provider of systems engineering, management and technical services. Founded in 1982, headquartered in Northern Virginia, with the LSA Photonics and Communications Divisions conducting research, development and production in facilities in Exton, PA. Specialties include acquisition and systems management support, systems engineering management, systems integration, laser optics and photonics, information technology solutions, research and development in night vision devices and other sensors, communications systems, warfare systems analyses, and production support. Our analysts and managers have world-class expertise in cost analysis, technology assessment, trade studies and business process engineering for activities at the leading edge of sensor and information technology. 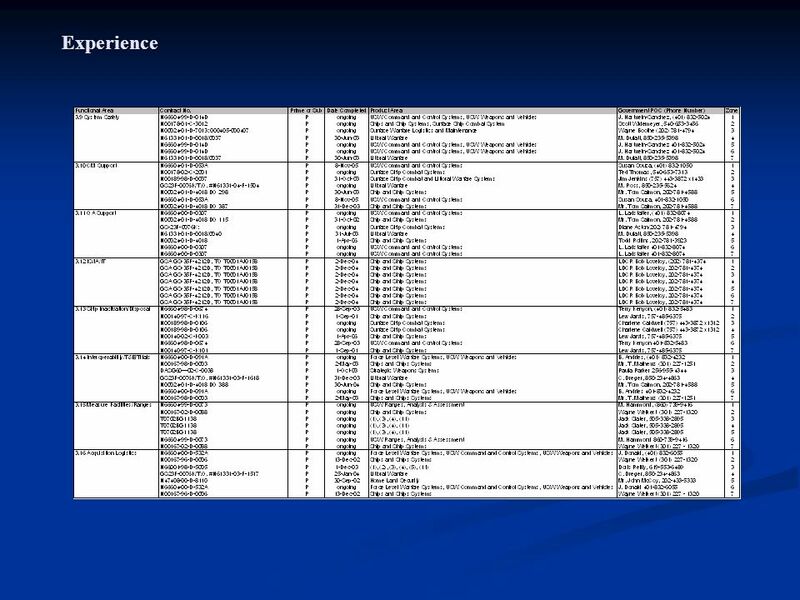 LSA uses state-of-the-art Computer Aided Software Engineering (CASE) tools for functional and requirements analyses of complex systems. This combination of capabilities makes LSA uniquely qualified to address a wide range of IT engineering activities from component and subsystem design and analysis to full-scale system modeling. LSA excels in reducing the risk, controlling cost, and enhancing operational utility during the transition from R&D to production. Finally, LSA Communications designs, manufactures, and integrates the commercially successful family of SupraConnect TM free-space optical (laser) devices for the communications industry and the Department of Defense. ADEA Solutions Adea Solutions is a CMM Level 5 certified, IT solutions and services company with over 1,100 team members in six countries. We leverage technology to create sustainable business value for clients in Communications, Retail, Healthcare, and Government sectors. Our adaptable Global Engagement Model provides our clients with the flexible ability to improve business performance. We are an award-winning company and we are leaders in our industry. Federal, State, and local governments are managing the same crisis - reduced taxes have caused lower IT budgets. At the same time, the need for improved citizen service has increased and both security and privacy are driving change. Similar to many commercial sectors, the need for technology-based solutions within public sector is driven by real business problems. At Adea Solutions, we understand public sector and have been providing valuable, high-quality IT solutions to address many of the problems facing public sector. For both large governments and local municipalities, we use technology to improve information access, increase operational efficiencies, and reduce government costs. With expertise in e-Government, automation, health, and regulatory compliance, our consultants assist our clients in creating secure, reliable, and sustainable solutions. 10 SEI SeaPort-e Team Sonalysts, Inc. Applying creativity, technology and human experience to solving problems is the Sonalysts heritage. Further advancing the military, business, government, education, and entertainment markets is our future. For over 25 years, our aspirations, innovation and client relationships have enabled us to become one of New England's largest and most experienced e-Business consultancy, the region's largest multimedia production facility and leaders in training, software development, systems engineering and research and development. We at Sonalysts dedicate ourselves to the new basics of business, the economy and global society. We lay out a compelling vision for our clients and then execute strategies to succeed. Establishing good customer relationships is our primary objective and we at Sonalysts have a stake in our customer's success. We are proud of who we call our clients; they engage us because we have the resources and skills that are essential to leadership. They know that our people are engines of innovation, growth and profitability. We intend to always provide our clients with a community of expertise and inventiveness few can match and to be recognized for delivering: Superior product quality and service, maximum value, and solutions that meet customer requirements. These are the values and business strategies that have made Sonalysts the outstanding company it is today, and they are the values and strategies that will ensure Sonalysts' reputation as a premier technology-based solutions company and partner of choice in the future. 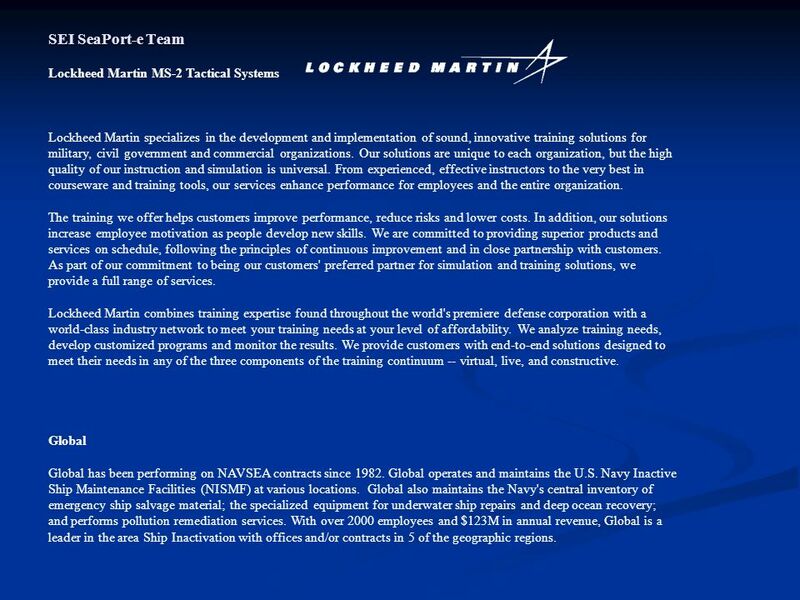 Lockheed Martin specializes in the development and implementation of sound, innovative training solutions for military, civil government and commercial organizations. Our solutions are unique to each organization, but the high quality of our instruction and simulation is universal. From experienced, effective instructors to the very best in courseware and training tools, our services enhance performance for employees and the entire organization. The training we offer helps customers improve performance, reduce risks and lower costs. In addition, our solutions increase employee motivation as people develop new skills. We are committed to providing superior products and services on schedule, following the principles of continuous improvement and in close partnership with customers. As part of our commitment to being our customers' preferred partner for simulation and training solutions, we provide a full range of services. Lockheed Martin combines training expertise found throughout the world's premiere defense corporation with a world-class industry network to meet your training needs at your level of affordability. We analyze training needs, develop customized programs and monitor the results. We provide customers with end-to-end solutions designed to meet their needs in any of the three components of the training continuum -- virtual, live, and constructive. Global Global has been performing on NAVSEA contracts since Global operates and maintains the U.S. Navy Inactive Ship Maintenance Facilities (NISMF) at various locations. Global also maintains the Navy's central inventory of emergency ship salvage material; the specialized equipment for underwater ship repairs and deep ocean recovery; and performs pollution remediation services. With over 2000 employees and $123M in annual revenue, Global is a leader in the area Ship Inactivation with offices and/or contracts in 5 of the geographic regions. 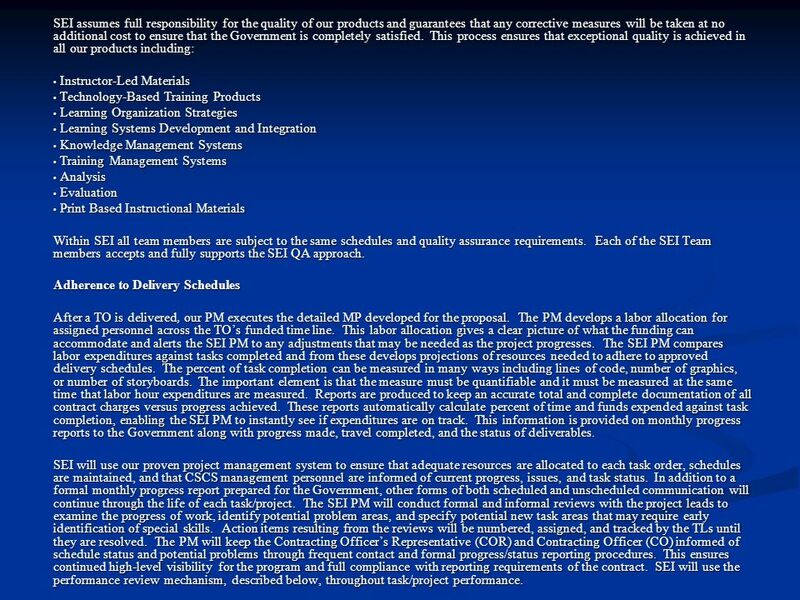 Download ppt "Welcome to SEI’s SeaPort-e Team Website"
More CMM Part Two : Details. 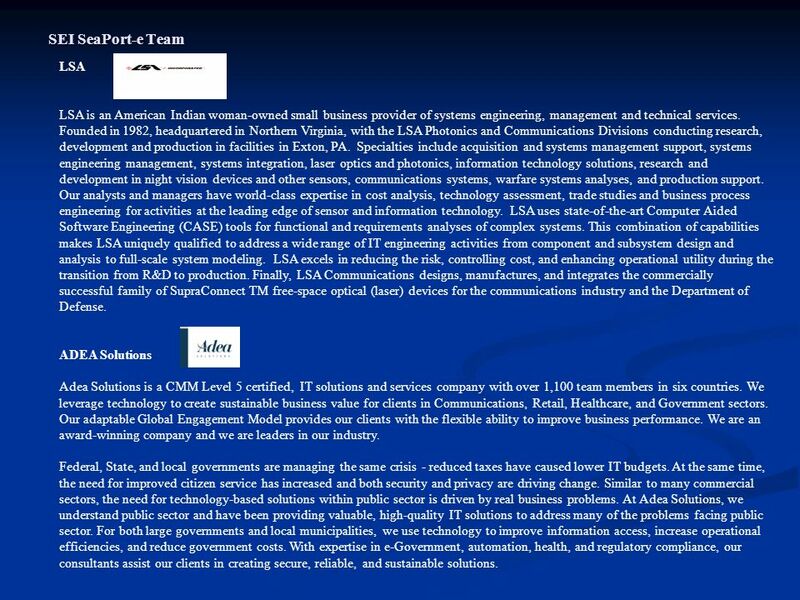 Overview 4Core Technology Group, Inc. is a woman/ veteran owned full-service IT and Cyber Security firm based in Historic Petersburg, Virginia. Founded.